This door phone security system package consist of 1 unit DS-2D (as door unit) and 1 unit KDP-601AM (as room unit). Door unit is typically installed near the door. Room unit is typically installed inside a secured room. Kocom’s intensive R&D and quality control has made Kocom a global top brand delivering exceptional good quality product to over 100 country world wide. 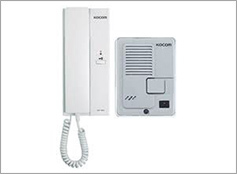 Kocom is the brand of confidence in door phone and intercom equipments.